Looking to do more? We Need You In Care Share! A Little Help is in need of volunteers to assist with the Care and Shareing Group. Nothing stays the same, including each of us. As we grow older, we naturally exerience more loss. We usuall equate "loss" with the death of a spouse, relative, dear friend, or cherished pet. Although we may not think of it in these terms, loss is much more: Loss of our dreams, projections, and fantasies; what our thoughts, plans, and hopes were for this period in our lives: loss or compromise of physical ability, mental acuity, fantasies about our primary relationships, our former careers as well as an aticipated loss. We are never the same after a loss. That's normal and to be expected. It is the human experience and exerts major impact on our emotional functioning. We may experience a myriad of feelings: anxiery, fear, guilt, anger, or depression. Please join counselor Hal Goldberg for a caregiver support group that will provide the framework to more deeply understand the impact of loss and grieving. This group provides an opportunity to explore these issues with others, who like all of us, have experianced various types of loss. Importantly, the group will establish a caring, listening, and supportive group community. Exploring our experiences and reactions to them will always bring us greater understanding and appreciation for life and what is yet to come. 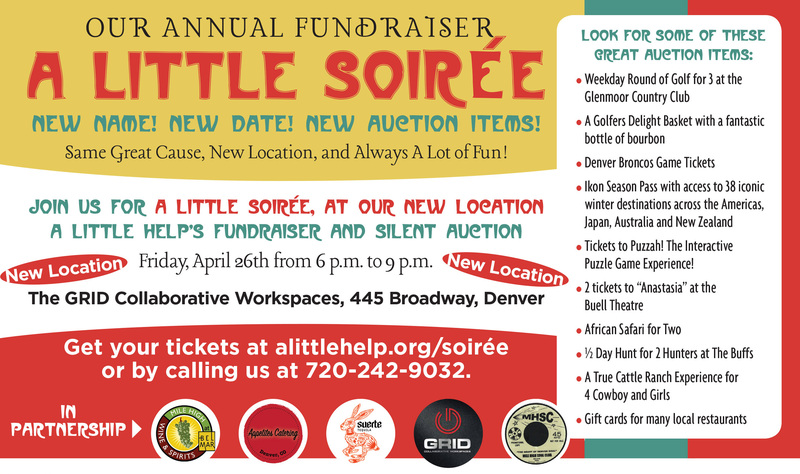 Please contact the office if you'd like more information at 720-242-9032 or Office@ALittleHelp.Org! Calling All Silent Auction Donations! It’s that time of year again! We are holding our annual silent auction fundraiser in April this year, and need your help acquiring auction items. Maybe the coffee shop you go to every morning wants to donate a gift card and coffee beans, or your neighborhood brewery would donate a growler certificate and tour! Please reach out to us if you would like a couple informational brochures to hand out, and we will be happy to mail them your way. Email office@alittlehelp.org with any questions! When?Friday, April 26 2019, 6 p.m. to 9 p.m.